Through the Artist in the Classroom Program public school teachers in Alameda and San Mateo counties can apply for a $500 grant to bring an artist or art historian for their classroom. Read below for some examples of the exciting requests we’ve awarded! 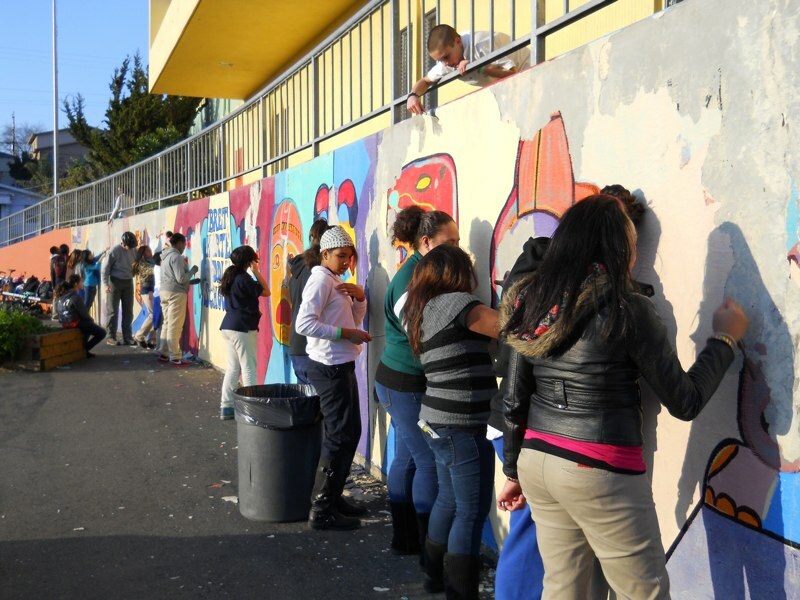 Muralist – El Granada Elementary, Half Moon Bay: Ms. Catherine Holland, a 4th grade teacher, was awarded a Visiting Artist grant for a muralist to help students create a culturally relevant mural for the school. Murals are a universal expression of art that represent communities and the people who live in them. We strive to maintain a deep commitment to collaborating with the community we serve to instill a sense of school pride as well as cultural and social pride. Illustrator – Bella Vista Elementary, Oakland: Ms. Carrie Johnson and her students will have an illustrator come into their classroom to help them with their illustration skills for their individual books. My class is studying a variety of children’s book illustrators, and will be attempting to hone our own illustration skills. Students will be able to share their finished books with family members and the larger school community, as well as online to become a part of our classroom library. Woodworker – Maxwell Park Elementary, Oakland: Students in Mr. Daniel Silberstein’s class will be working with a woodworker to create altars to their family histories. The students will paint and decorate the boxes with family images and mementos. They will then write a paper about their family history and cultural connections to life and death. The boxes will then be displayed for the school and community to see. received a grant for a 5 week mural art project for 6th-8th grade students who are new to the United States. It’s common for my students to feel disconnected from the school community because they are just learning the language and customs of our society. We will create a mural for the school, which will increase their sense of connectedness and involvement in the community. Modern Artist – Farallone View Elementary School, Montara: Ms. Amy Rhode’s 5th grade students will be creating two “pop art” projects under the instruction of a modern artist. Art lessons have been essential in bringing together our ethnically diverse school community and stimulate our children’s interest in art. We are confident that the students will leave the lessons with a love of modern art and open minds to explore other avenues of learning. Poet – Hoover Community School, Redwood City: 4th grade students in Ms. Holly Watts’ class will be working with a poet to help them explore poetry composition and public performance. He will introduce students to multiple literary tools; lead students through various creative writing activities examining personal and cultural identity, individual hopes and goals, interpersonal conflict and healing, and issues of social inequity and social justice. Storyteller – Woodrow Wilson Elementary School, Daly City: A storyteller will be visiting Ms. Alisa Grassi’s 2nd grade class for 4 weeks to help her students develop in the area of public speaking. This would be perfect for my students’ needs. My class thoroughly enjoys taking part in plays and are all eager to play the parts, even the most reluctant and less skilled performers. This program is made possible with funding from the Geballe Family. Learn more about how to apply here. This entry was posted in Uncategorized and tagged art, education, program grants, youth. Bookmark the permalink.